Psalm thirty-seven reads like a message or a sermon. There is no hint of prayer or praise, but it is chalked full of instruction. As a boy growing up, I enjoyed building models. I specifically was interested in anything that was from the World War II era. I would do some chores for my grandmother, and she would take me to K-mart to pick out a model. In the excitement of wanting to assemble it, I would hurriedly look over the instructions and begin trying to put it together on my own. At times there might be an extra part left over. I simply had not followed the instructions. I believed that my own way was the best way, and the model was incomplete. I believe spiritually speaking as Christians we often times follow our own instructions, and our lives are not the lives that the Lord would have for us. The Bible says, “Happy is the man that findeth wisdom, and the man that getteth understanding.”(Proverbs 3:13) As a believer in the Lord Jesus Christ, we must always come to God’s word for true wisdom for our lives. One will find wisdom where wisdom lives, and in doing so they will gain understanding. The Bible will lead us by its God-breathed instructions (2 Timothy 3:16). We will both find wisdom and understanding that will not only impact our lives, but the lives of those around us. I want us to carry this thought with us as we look to Gods word for instruction; “If we do not apply that which we have been told, we will not experience all that we can know.” I pray that our time in Psalm thirty-seven will lead us over and over again back to God and His Instructions for our lives. When we have the correct perspective, we will look at what appears to be prosperity through the eye lens of God’s word, and we won’t feel envy for the comfort, ease, and success of the workers of iniquity. We should feel compassion knowing that the life they live at this very moment is as good as it is going to get. The word fret has the meaning: to be irritated or angry. We often exert so much energy over things that we should just simply lay down. When we stir up such feelings in our hearts, our lives do not bare the fruit of the Spirit, (Galatians 5:22-23) but plants the bitter seed of the flesh. Isn’t it interesting to know that such feelings were prominent even in the time that David wrote this Psalm? 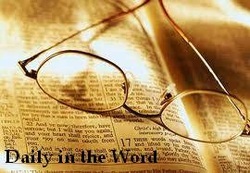 _In our study today, we have some key words that will strengthen our faith. It is so obvious that the Lord knew that we would often times need the same instructions and the same encouragement over and over and over. I have found His grace and long-suffering with me to be a blessing, and surely undeserving. When I think of my meager faith in light of the many times He has shown Himself to be faithful again and again, I simply must ask Him for forgiveness. Our key words are trust, delight, and commit. When we trust in the Lord, we will continue on His path and in His will for our lives. As we continue to trust, we will do good because we will be following Him. The sure path of obedience will lead to good. I find it interesting that we will plan a week or a day around the trust we put into a weather man or woman who really can’t guarantee for certain what a day might bring. We need to take heed of David’s words, and as we do, we will feed on God’s faithfulness. The good shepherd will look after us. Psalm 23:1 is a wonderful reminder of God’s faithfulness, “The Lord is my shepherd; I shall not want.” The evildoer will trust in himself, and, in turn, they will find a hard way that resembles not the one who trusts and follows the Lord. When the Lord becomes our delight, His delights will become our delights, and that is how we get the delights of our hearts. After I was saved, God began a powerful work in my life. There was a change in those things I once delighted in, and that change came through the Holy Spirit working in my heart, (John 16:7-8) and God’s word shaping and teaching me true delight. David says, “Delight thyself also in the Lord.” It starts with us and it is an action we must desire to initiate. The word commit in our text literally means; roll of onto. Psalm 55:22 says, “Cast thy burden upon the Lord, and he shall sustain thee: he shall never suffer the righteous to be moved.” We must roll off those things on to the Lord that are heavy and burdensome. We often times roll things over and over again in our minds, and those things will eventually make their way to our hearts, and they take hold of our lives. We trust to often in our own counsel, and that should not be. Please don’t misunderstand; we are not to fold ourselves up as a tent and check out of life. We continue life as we roll off those things onto the Lord, and we remember what David writes in verse five, “Commit thy way unto the Lord; trust also in him.” We commit our way to the Lord and then we trust in Him and watch Him work. As we trust in the Lord, and as we delight in Him, and, yes, as we commit our way to Him, we find that if there is a season of reproach or doubt, or maybe our character is under scrutiny, we can count on His righteousness to shine through us. The fruit of a life fully dependent upon the Lord is that we will be more Christ like. That fruit will bring glory to God; it will bring stability to the life of a believer, and will bare a wonderful testimony for the saved and the lost. _ James 1:22a tells us, “But be ye doers of the word, and not hearers only.” If we will be quick to do that which we hear from God’s word, we will be directed, and every course of action that we take will be put through the grid system of God’s word. God’s word will sustain, prepare, and protect the hearer and the doer of His word. The end result is that we will live and grow at the same time. We will find rest in the one we trust. Contentment will be a by-product of our learning to trust God. And why is that? Because, we will find rest when we trust that He knows what’s best for the totality of our lives, and that He is over everything. We often times either want to take the reins out of the Lord’s hands, or struggle with giving them over to Him. I would not be truthful if I did not include myself in this struggle. We must rest in the Lord and wait patiently. Patience is built when past provisions are remembered. Charles Spurgeon once wrote, “Time is nothing to Him; let it be nothing to you. God is worth waiting for.” We are reminded for a second time to, “Fret not.” I have learned repetition is a good tool for learning, and it seems to be a discipline we find in God’s word. We are not to fret because of the wicked and their evil devices. The wickedness of the schemer shall not go unnoticed. It might be a secret in their heart, but the Bible says, “The eyes of the Lord are in every place, beholding the evil and the good.” (Proverbs 15:3) Dirty success is the design of the Devil, and will one day be brought to light. What a contrast between the wicked and the child of God. How much better it is to be able to delight in the abundance of peace. Peace is a pillow that only God can fluff and when one knows the peace that only the Lord Jesus can bring through faith in Him for their salvation, they will know such a peace abundantly. _Our attitudes often lead us to the actions that we take, and those actions will lead to a specific outcome in one’s life. The outcome will be the fruit of our choices, whether they are good or bad. In the end, it all points straight to us. In our study today, God’s word reveals the attitude, actions, and the eventual outcome of the wicked. It is a word of warning that many would do good to heed. It should not surprise us that David, being led by the Holy Spirit, describes an occurrence in his day that is no different than what we see in our time. “The wicked plotteth against the just.” The root of evil is often time in full bloom as we read the harrowing stories of the evil plans and plots that are carried out against Christians in faraway lands. These plans are hatched and deep rooted in the pit of darkness. The disdain for the just is so great that the wicked gnash their teeth together at the site of them. Picture the look on one’s face if they were to come at you grinding or striking their teeth together. The face only displays that which is found in the heart. The possibility of such an occurrence will increase as our own country becomes more intolerant of Bible believing Christians. That which they were doling out will return upon them. Psalm 7:16 in speaking of the wicked says, “His mischief shall return upon his own head, and his violent dealing shall come down upon his own pate.” We sometimes skip over the wrath of God, and we are doing no one any good if we only preach a part of the truth. Is God a God of mercy? Yes indeed! Is God a God of wrath? Yes indeed! My prayer is that our study will bring to light God as He is, according to His word, and that we will take serious the salvation of those around us. A word of warning indeed! _ Our verses continue in bringing forth the contrast between the righteous and the wicked. I want those who are born again to drink deeply from the well of God’s word as it pertains to His children. Please remember those who are born again can never take credit or boast about what they did to be declared righteous. Salvation is a gift that has been made possible through Jesus Christ. Our salvation was not free, a price was paid. Isaiah 53:5 says, “But he was wounded for our transgressions, he was bruised for our iniquities: the chastisement of our peace was upon him; and with his stripes we are healed.” David, led of the Holy Spirit, gives the child of God comfort and hope in the middle of a dark world. Worldly wealth, gotten by ungodly means, will never satisfy or bring peace. Its origin is corrupt, and it is a momentary gain with monumental consequences. With that said, let’s focus on the righteous man and his considerable wealth. The righteous man may be measured by his humble home or few belongings, but in God’s way of measuring wealth, he or she is rich beyond measure. It comes down to temporal versus eternal. Many choose the latter and are considered paupers according to the one who matters, GOD. It is a comfort to know that as a child of God, we are in good hands. The hands of the living God! God is all powerful, all knowing, and He is everywhere. (Psalm 139) There is confidence that one gains from the comfort of knowing that the God of the universe is upholding His own. Pain is the lot of the wicked, but power is the promise for the righteous. Simple can never be too simple. The righteous will not be ashamed, but shall be satisfied. If not now, in the days that await them in heaven. What once was will be no more, in reference to the wicked. They shall perish, and they shall be as the sacrificial fat that was consumed on the altar. Their position sealed their fate, for they were the enemies of God. When I was growing up we heated our home with a wood stove, and I can still picture the plume of smoke rising above the chimney on a cold winter’s day. That smoke would be visible for a moment and then it was gone, so shall it be for the wicked. They will vanish. Dear Christian, consider God’s care for you according to His word, and stand on that which is rightfully yours in Christ Jesus! _With our last study on Wednesday, we hit the half way mark of Psalm thirty-seven. I like to think of each verse found in God’s word as an opportunity to learn, to grow, and to hear from God while in His word. Psalm 119:140 says, “Thy word is very pure: therefore thy servant loveth it.” My mom, from a young age, taught me that there is no substitute for the truth, and she was always sure to encourage me to be about the truth. I carry that with me still today. I hope that God’s truth will be the vantage point that you approach all facets of your life. The wicked borrows and does not pay that which they owe. This is a picture of the ways of the wicked, yet may it not be a portrait of the child of God. God will not bless what He does not approve. The Christian should be about the business of doing good business. I understand that there can be circumstances that can arise. Our aim should not be that of the wicked but to pay that which we owe. God has a way of blessing His children, and that leads to the mercy that is shown to those who are in need. Mercy leads one down the road of giving, and that leads to God being glorified, and many blessed. Once again, a contrast is given. One has an inheritance provided by the Lord, the other has no such inheritance that awaits them. One will live and know true life. The other shall be cursed by God and cut off. We have a solid word that describes the solid steps of those who are in the Lord. Verse twenty-three says, “The steps of a good man are ordered (established) by the Lord.” Any path that is ordered (established) by the Lord will be the best place for anyone to take their steps. This world can be likened to those rickety bridges that are made of rope that have been strung across a great divide. If we want sure footing on this pilgrimage we certainly should desire Gods direction. God will delight in that which he has ordered. Contrary to what the evangelist on television peddle with their prosperity preaching, Christians will have and know their share of heart breaks, out breaks, and tough days! “Though he fall, he shall not be utterly cast down” is what the verse teaches us. These are shouting words for the child of God, “For the Lord upholdeth him with his hands.” The all-powerful, the all-knowing, the living God of the universe will uphold you dear Christian. These certainly are solid words in the shaky days we live in. _Psalm 119:24 says, “Thy testimonies are also my delight and my counselors.” I pray that we begin this week with such a desire for the word of God in our lives. Let’s anticipate the good things we will take from Gods word starting this very moment. We need to put down evil and let the Holy Spirit have His way with our hearts, minds, and lives. Be quick to lay aside that which doesn’t belong to the child of God. Depart from the evil of murmuring. Turn away from all bitterness and speaking badly about one another. There is no gain in evil only heart ache and a grieving of the Holy Spirit. The Lord loves judgment or justice. Let’s break down two words within this twenty-eighth verse. I. Forsake-to renounce; turn away from entirely; abandon. Hebrews 13:5 says, “For he hath said, I will never leave thee, nor forsake thee.” What a promise that should ring in our hearts as we make our way throughout our days. We have another gem in Psalm 9:10, “And they that know thy name will put their trust in thee: for thou Lord, hast not forsaken them that seek thee.” The promises of God are like steel in the spine of a Christian. They strengthen their steps and straighten their backs. If a family tradition is carried on into the next generation, the lot of the fathers and mothers will be the same as the sons and daughters. The wicked will be cut off. _ A path does not become a path until the ground is tread upon time after time. In the woods behind our home, there are many paths that often lead to a creek. The deer have treaded upon that patch of ground again and again which leads them to their precious water supply. We have a lot in common with those deer, spiritually speaking, when we time and time again make our way to the banks of the Bible and drink from God’s powerful word. I pray that the path is well worn. I once heard these words in reference to this world; “I wear this world like a loose garment.” For the born again believer, this world is not our home. We look forward to that which is rightfully ours in Christ Jesus. We are joint heirs with Jesus Christ and heaven is our home. We will one day know that home forever. Do you look forward to your inheritance as a child of God? Colossians 3:2 instructs us to, “Set your affection on things above, not on things on the earth.” Wise instructions indeed! When our eyes are fixed upon this world, we lose sight of our hope in the days to come. Don’t allow this world to trip you as you make your way home. One often speaks that which they have been taught or what they have heard from the time they were a child. For the wicked, their mouths speak the language of the world, the flesh, and the devil. It should not be so with the righteous. “The mouth of the righteous speaketh wisdom.” Before I was saved my philosophies and views were those of a fool, and the proof of that was found in my words. As the Lord continues to grow me in His word, wisdom has been a by-product of the growth. As God’s word enters in, there will be wisdom found within that will benefit our lives, as well as bless the lives of those who we come in contact with. Justice and honesty will be the fruit of the tongue of the righteous. The foolish words spoken of earlier should be less and less upon the tongue. Words are not like a fishing lure that you can reel back in after you have made your cast. Words seasoned by God’s word will be filled with wisdom and judgment. _When we see through the eyes of the Bible, we will not tremble at the sight of the wicked. Our confidence is not in ourselves, but in the living God. I recently read these words from a man by the name of Leonard Ravenhill, “One of these days some simple soul will pick up the Book of God, read it, and believe it. Then the rest of us will be embarrassed.” Those words hit me like a hammer between the eyes. We will truly never live until we come by way of God and His word. Darkness cannot stand the sight of light. Darkness rubs his eyes as the light exposes the position and thus the plans of the wicked. God’s word acts as the powerful light that flings open the door to the ungodly and the wiles of the devil. God’s truths reveal the certain destiny of the wicked. It also acts as the material that builds the confidence of the redeemed. What is the material? Truth! Yes, the wicked watch the righteous with the plan and intent to slay them. But the Bible says, “Behold, the eye of the Lord is upon them that fear him, upon them that hope in his mercy” (Psalm 33:18). The wicked watch and so does the God of the Universe. A lion stalks in hopes to slay the prey, and the devil is that lion who goes about roaring. The accuser will spew out his accusations (Revelation 12:10), but the redeemed have an advocate, and His name is JESUS! 1 John 2:1-2 teaches us the truth about our advocate, “My little children, these things write I unto you, that ye sin not. And if any man sin, we have an advocate with the Father, Jesus Christ the righteous; And he is the propitiation for our sins: and not for our sins only, but also for the sins of the whole world.” The Righteous will not be condemned when being judged by Satan or those who are his. Our advocate, the Lord Jesus Christ, pleads His blood in our defense to the Father when we sin. Jesus’ finished work on the cross satisfied God’s righteous judgment of sin. The devil has no grounds for his case when those he is accusing have come to Jesus Christ for the saving of their soul. “Who shall lay anything to the charge of God’s elect? It is God that justifieth” (Romans 8:33). These are words you can trust in. _ I have found the easiest things to teach can be the hardest thing to learn to do. Let me spell it out; “W-A-I-T.” It is easy to teach and preach and implore my wife, my family, and my friends to wait on the Lord. One can quote God’s word and refer to those scriptures that speak such a truth. The question we must ask ourselves is do we practice what we teach and preach? Are we putting into motion what God’s word tells us to do? Webster’s defines the word wait: “to stay in place in expectation of; to look forward expectantly.” We will wait expectantly on those we trust. If I can’t believe a word that one says, why would I trust or put any hope in a promise that they make? But we can trust GOD! Deuteronomy 32: 4 teaches us that God is a God of truth. Let’s remember this as we begin our study this week. "Wait on the LORD, and keep his way, and he shall exalt thee to inherit the land: when the wicked are cut off, thou shalt see it. I have seen the wicked in great power, and spreading himself like a green bay tree. Yet he passed away, and, lo, he was not: yea, I sought him, but he could not be found." We are to wait on the LORD and keep His way. The believer would do well to keep busy while waiting. Continue down the path of obedience, and in due time the Lord Himself will exalt you, and your inheritance will come to fruition. As a young boy, one year for my birthday, I knew I was getting a bike. I could hardly wait for that Huffy Thunder Road. My Mom and Grandmother went to pick up my new bike. Now I anticipated the return of my Mom and Grandmother with the bike. I was waiting in anticipation for the promise of my birthday gift. Spiritually speaking, do we live our lives looking forward to the promises of God, or do we look around in wonder at the wicked and wish we had it as good as they have it? O how the mighty will fall and the righteous will have a ring side seats. Over and over again, God’s word tells that we should not envy the wicked. Their temporary gain will one day be a horrible memory in hell. I know many people who seemingly go through life and their power, influence, and wealth increases by leaps and bounds. The road is smooth and their touch is golden. They give no thought to God or that He is the source of their bounty. They say, “This life you live for your God is to be commended, but it is not for me.” They will be as a tree whose leaves will fade and whose trunk will not withstand the fire of the refiner. They will pass away, they will fade away, and they will not be found. The believer would be wise to hold on to God’s truth and fix their eyes upon Jesus. Anticipate the promises, and live with Heaven always upon your mind. In many things, comparison is inevitable. We dissect, discus, and compare everything from people to different times in history and even our favorite sports teams. In our study of Psalm thirty-seven, David, led by the Holy Spirit, has brought to the surface the comparison between the righteous and the wicked. The fruit of one’s life will only reveal that which they are rooted in. Ones works and ones words will either reveal a life that is rooted in the Lord Jesus Christ (made possible by the blood shed of Christ Jesus, the Son of God, and the understanding made possible by God’s word and the Holy Spirit that he or she is a sinner and can only be declared righteous by repenting and calling on the Lord Jesus to forgive them of their sins and to save them) or a life that is rooted and ruled by the prince of the power of the air. (See Ephesians 2:2-3) These are the wicked. When we started, we said that this Psalm reads like a message being preached. There is a warning for both sides. The righteous and the wicked. God’s word can be likened to an arrow that when it hits its mark, conviction is administered to the heart. That includes both the lost and the saved. Thank God for His Word and the power within it. Many have seen the downward spiral of the wicked, and the sadness of such a life is tragic, heartbreaking, and hard to watch. We have been reading about and coming up close to such lives in our study. However, David says, “mark”, and “behold” the perfect (blameless) and the upright. Our attention should be given to the godly whose aim is to please the Lord and to follow Him for the totality of their lives. However… we keep our eyes on the Lord Jesus while observing the lives of those who also keep their eyes on the Saviour. One would do well not to imitate man, but to desire to be more Christ like. Other Christian lives are worthy of our study, but they are not worthy of our worship. The path of tribulation is accompanied by peace, and leads to a Heavenly home void of trouble and full of peace. The end is really the beginning of all beginnings! The transgressors will be destroyed and the wicked cut off. The theme of this comparison between the righteous and the wicked has been preached time and time again within the verses of this chapter. Dear reader, whoever you are, and wherever you are in your life, I want to ask you, where is it you find yourself in such a comparison in God’s word? Your decision will determine your destiny. Go now to the Decision and Destiny page and allow God’s word to speak to your heart. I have prayed for you. We have come to the end of our study of this wonderful message from Psalm thirty-seven. When we began, I had a thought that I wanted us to carry with us, “If we do not apply that which we have been told, we will not experience all that we can know.” We opened each verse with the intention of handling them and reaping from them all that the Lord would have for us. My prayer is that each verse will have acted like a seed in our heart, and that a crop of wisdom and understanding will be nurtured to full maturity. I pray that Holy Spirit will continue to teach us as we finish this study. Scarcely, I’m afraid, does the child of God depend on the deliverance or the strength of God. In this Psalm, David has written about and taught us that in this world we have all around us and on every side the wicked. We tip toe down the path of life when our steps should be strong in the Lord our God. Arrogance does not equal holiness, and that is not what I am speaking of. I am speaking of an inner strength that has its origin in the Lord and His word. From such strength comes an outer mettle that is of the Lord. If one would memorize verse thirty-nine and couple it with Psalm 27:1 “The Lord is my light and my salvation; whom shall I fear? the Lord is the strength of my life; of whom shall I be afraid”, we would be lions and not kittens. God is our strength in times of trouble. It is only in times of trouble that we can learn such strength. When the wicked rage against the righteous, the God of the righteous shall be their salvation and strength. There is no helper like the Lord! And there is no deliverer like Jehovah God. If we will only trust the one who is worthy of our trust, we will know the real life. Psalm 84:12 says, “O Lord of hosts, blessed is the man that trusteth in thee.” A word of strength indeed. _To view past DITW studies, Click Here to be taken to the archive page.